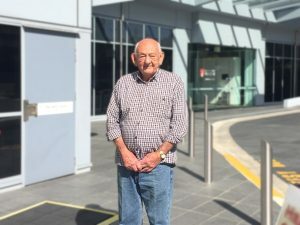 Read more about John’s story below, his battle with emphysema, treatment and current lifestyle. I first noticed symptoms of emphysema about five years previously. I was a very active person and travelled extensively for work, flying around Queensland but I started to battle at different times with my inability to complete physical tasks. I also started to become quite anxious during these trips as I would experience shortness of breath on the flights. As this claustrophobic feeling grew, it got to a stage where I was avoiding business trips altogether, emphysema was affecting not only my work but also my day to day activities. After my condition was diagnosed, I made the decision to retire and move back to Sydney with my wife to be closer to our family. We travelled for six months while building a new home and during this time I struggled with even simple tasks such as pulling a suitcase; it would leave me breathless for 10 minutes at a time. One night a friend told me he saw a television program about a new treatment for emphysema, where special devices called endobronchial valves are implanted into the lungs. I made contact with the hospital featured in the program and managed to get an appointment with one of the doctors. He performed various tests to confirm I had moderately-severe Chronic Obstructive Pulmonary Disease, COPD. About seven months ago he decided to try this treatment option. He explained that the valves will help reduce over-inflation of some parts of my lungs and improve overall lung functionality. At last, there was some hope that my breathlessness and quality of life could be improved. On the day of the procedure, the valve implantation went smoothly and I woke up merely 20 minutes after I was wheeled in. That night I stayed in Intensive Care and woke up feeling very positive. The nurse informed me that she was going to give me a wash but I asked if I could have a shower, since I felt up to it. Although hesitant, she allowed me to go ahead on my own. At that point I realised that over the last 12 months, having a shower was one of the most draining parts of my day; to even dry myself was an immense task. However, that morning I could already sense a physical change, I had a shower with no problems whatsoever. 24 hours after the procedure, I was moved to a ward and managed to walk around freely. I ate normally and felt a noticeable improvement already. The ward staff even mentioned that I could in fact go home the following day. Although, when my doctor came to visit he explained that it was best to wait at least four days after the procedure to ensure any potential risks, however unlikely, are eliminated. I went home as planned on the fourth day as per my doctor’s instructions. My doctor continued to monitor my progress by asking me to perform various lung function tests. He was always very impressed with my continual improvement. It truly is incredible, on a measurement’s scale there has been such a significant progress. Earlier this year my wife and I travelled to Ayers Rock. This would not have been possible prior to the endobronchial valve procedure. We made the most of each day, waking up early to see the sunrise and heading out every night. I was able to use my suitcase without any hassle and never felt fatigued during the entire holiday. We live a very active lifestyle now, travelling to and from the Gold Coast. We walk anywhere and everywhere, spending time with our daughters and granddaughter. Most of our days are spent out and about, keeping active by walking as much as we can, making the most of my improved quality of life. 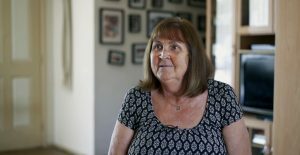 Read more about Julie’s story below, her battle with emphysema, treatment and current lifestyle. I first discovered I had emphysema around four and a half years ago, experiencing shortness of breath which impacted my quality of life significantly. Every day I struggled with basic housework tasks, even a short walk to the groceries became a hassle, followed by dizziness due to lack of oxygen. Working had become more difficult, the thought of having to go up and down the stairs was one thing I dreaded. Everyday life was terrible and according to my doctor it was only going to get worse. After the valve procedure I am no longer dreading the thought of having to perform simple tasks such as sweeping the floor or vacuuming the mats. I noticed at work I gradually stopped thinking about going up the staircase. It has definitely improved my quality of life. I have just returned from a holiday in Queensland and walked every inch of the theme parks with my family, I feel 100% better. I would say everything about my life has improved. My grandchildren are my world and I am given hope that I will be around when my grandchildren get married. I didn’t want to put them through the agony of losing their grandma. Before the procedure I was the type of grandma that would sit on the chair and watch them play, now I am able to physically join in and really be a part of their lives.